If you’ve been living under a rock for the past couple of weeks, then you may not have heard of a new smartphone game called Pokemon GO that was released in the US, and more recently in Europe and Japan. Pokemon GO was not a very highly anticipated game. Nintendo talked about it recently as part of a large video game expo, but the details released left gamers feeling like the game would be mediocre at best. That’s why it came as a great surprise to Niantic, the company that Nintendo and the Pokemon Company partnered with to make the game, when Pokemon GO had more active users than Twitter within only a few days of release. It hit the market like a lightning strike. The servers have had a very difficult time keeping up with demand, a happy problem for a relatively unknown company like Niantic, and for Nintendo, a company that has struggled over the past few years to release any real hits on the same level as the Wii. Let me explain the mechanics of the game. You walk around and catch Pokemon. As you catch Pokemon your character levels up and you have the opportunity to battle gyms. In the game, you are part of one of three teams, and if you defeat the gym, your team takes the gym as its territory, king-of-the-hill style. I haven’t really had a chance to play the game much myself just yet, but that’s the basic gist of the game. It’s a simple concept that you might not expect to explode in popularity. However, the devil is in the details. For one, Pokemon is a beloved series that my generation grew up with. Even though we’re now in our late 20’s and early 30’s, we still play and love Pokemon games. Pokemon is still one of Nintendo’s highest selling franchises, and even their executives have noticed that sales demographics show that young players have followed the series as they grew into adulthood. Another detail is that the game uses Google Maps information to fill the world of Pokemon GO. As you walk around the real world, your avatar moves as well using GPS information. Certain real-life locations are designated as areas for receiving items or for being gyms, which means people will be encouraged to gather in those locations. Pokemon are also generated using Google Map information. Pokemon begin life in the cloud, which means that ALL players, if they are at a certain location, can see the same Pokemon. In other words, there is a certain scarcity of Pokemon. If a player catches the Pokemon on their smartphone, then other players can’t catch it or see it anymore. The fact that other players can see and interact with the same Pokemon means that players can indirectly affect each other’s experience within the game world. All these factors, along with some items that also have similar influences on the game world, make Pokemon GO a highly social game. Players meet up in groups and play together, sometimes in very large groups. In my own experience walking around Saga today, I’ve seen couples, groups of friends, and even father’s with their children walking together while talking and playing Pokemon GO. Gyms are rarer locations compared to the special item or Pokemon locations, so they have a special influence on the game, as well as the real world. Of course, players want their team to capture and hold a gym, so they will go to the gym to make sure their team maintains control. In the US, churches are often designated as gyms. However, more importantly, businesses are sometimes chosen as gym locations as well. In fact, being a gym has been very good for businesses in the US, to such an extant that those businesses have made kiosks, flags, special items, etc. to offer to Pokemon GO players. A couple of days ago, there was a leak on Japan’s largest online discussion forum that revealed that all McDonald’s restaurants in Japan would be designated as gyms. Because of the leak, there was even greater anticipation for the release of the game, and therefore Niantic felt that they had to delay the release a couple of days to prepare servers to keep up with demand. Pokemon GO is probably the most social video game released in history. Its release has both social and economic implications both on players and non-players alike. Even if you’re not a gamer, if you are a business owner/manager, knowing how to take advantage of the game can contribute greatly to your business. Companies can, just like McDonald’s has, become sponsored gyms as a marketing tool to attract customers. The game drains battery power very quickly, so many people buy battery packs for their phones. Some people even share battery packs with other players. Strangers meet up and walk around with each other to play the game. Some people have joked that Pokemon GO is has done more for the health of young people—by encouraging them to walk more—than Michelle Obama has done with all of her health initiatives over the years. 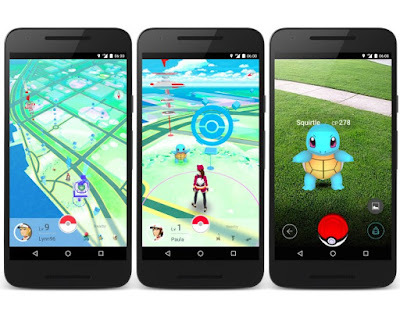 The release of Pokemon GO is truly a unique occurrence in gaming history and will be studied by video game companies in the future. It bodes well for Nintendo, since they are planning to release a new gaming “platform” next year that will include some sort of ambiguous “quality of life” element. It’s already given a significant bump in Nintendo’s stock price (it doubled in a week). The real test for Pokemon GO will be if they can maintain the momentum—active users—while continuing to release updates in the future. The game currently only has a fraction of the Pokemon that exist in the Pokemon universe, so there are almost certainly going to be more Pokemon added in the future. Whether new gameplay elements will be added is another question, but if the active user base remains high, then I’m certain that Niantic and Nintendo will add more gameplay elements to the game.